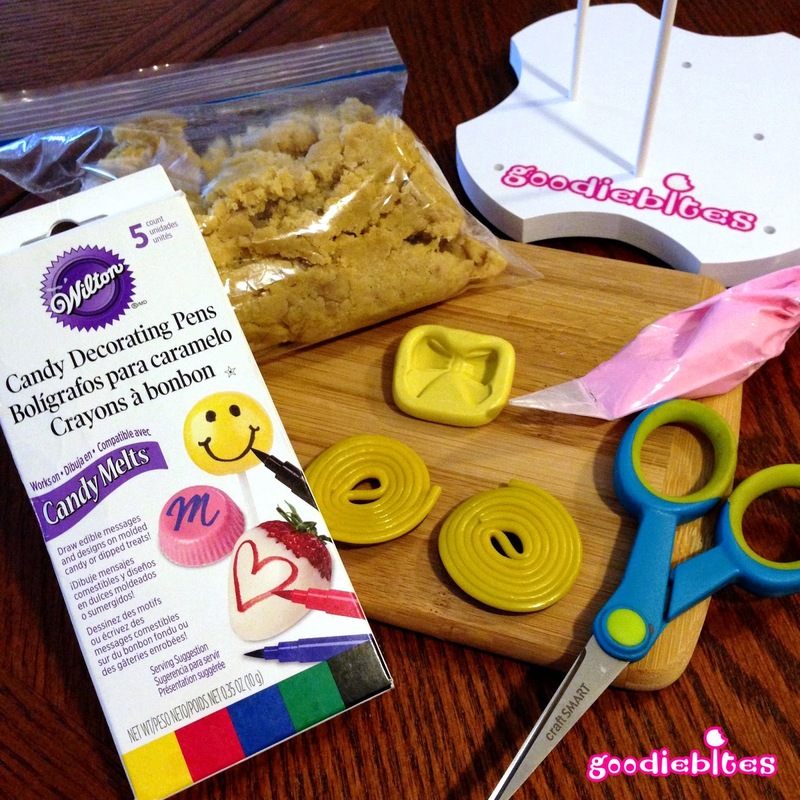 GoodieBites is back with a fun cake pop tutorial! 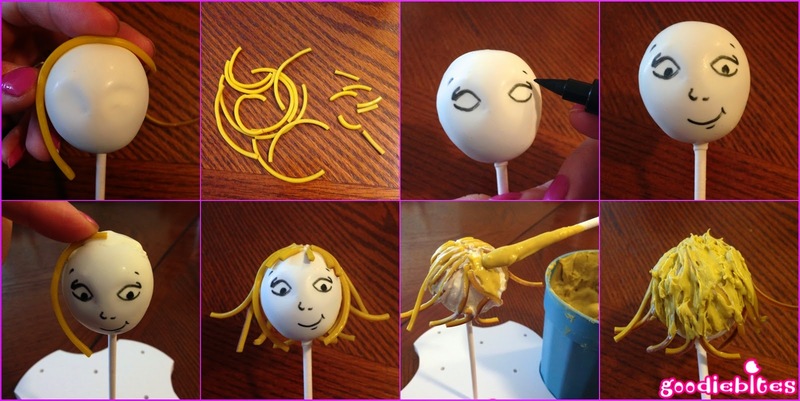 This is an easy way to make faces and really impress your kids and family with your awesome cake pop skills! Hi Everyone. Summer is finally coming to an end (my least favorite season- sorry to all the sun worshipers!) and September is upon us. I’ve always loved September. Back to school for my daughter, nice cool weather on the way, planning holiday meals as well as trips for the family, and this year it has an added special element – I will be getting married September 13th!! Woo-Hoo!! For our honeymoon we will be going on a cruise in October, but many years ago the fanciest thing for many people to do for a honeymoon was come to New York and stay at The Plaza Hotel. That brings me to today’s tutorial for the famous 1950’s children’s book character Eloise. She was a precocious 6-year-old young lady who lived at the Plaza with her nanny. She was very ‘helpful’ to the staff and guests, even when not asked, and got into a heap of trouble yet got away with seemingly everything. Okay, enough literary history – read the books when you get a chance. Now on to the tutorial! First, shape Eloise’s head. Make a round ball and then slightly curve it on the bottom to make the chin. Make small indents on the face for the eye area. Chill. In the meantime, using the pink filled pastry bag, fill the bow mold. Make sure to tap the mold when filled to get rid of any air bubbles. Place in the fridge to chill for about 10 minutes. 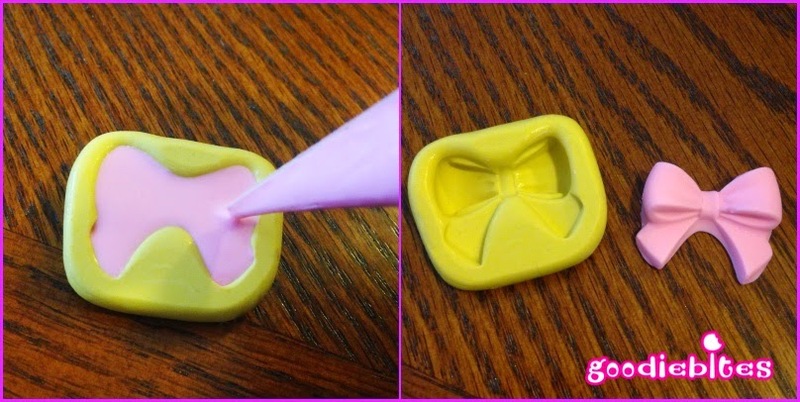 Let set mold sit on counter for a minute or two and then gently remove the bow. Dip Eloise in white coating and allow to dry. Once she is ready, cut yellow licorice into hair-length strips. Don’t forget to also cut smaller pieces for her bangs. Then use the black candy pen to add details to her face. Her features are pretty simple. Attach the licorice all around using the melted white candy. As long as she has enough wisps of hair don’t worry about the ‘bald spot’s. 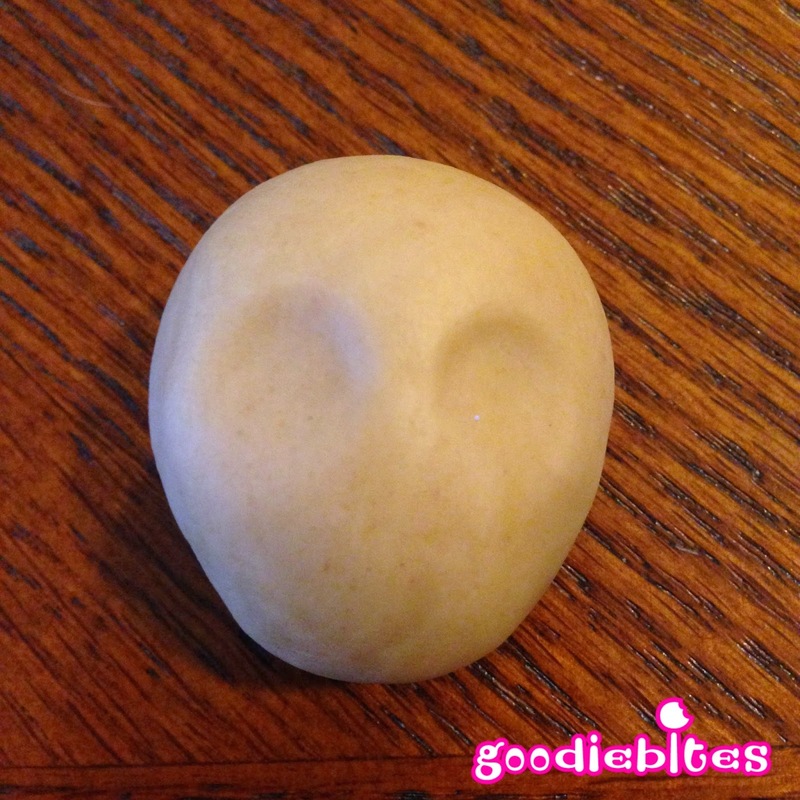 Once you’re done adding the hair, fill in the white spots with the yellow melted candy. When everything is dry, attach the bow with the melted yellow candy. Thanks for stopping by for this tutorial. 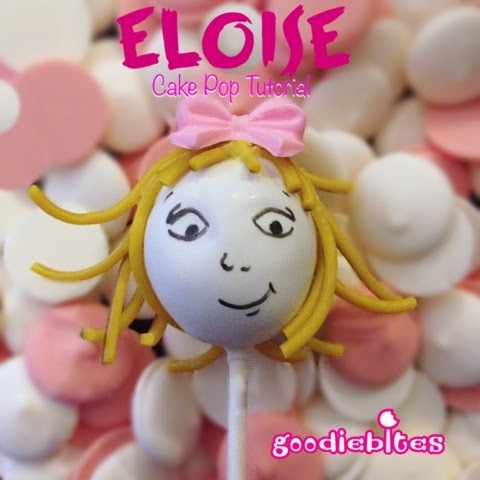 Please check out our website at www.goodiebites.com where you can order cake pops or sign up for one of our upcoming NYC cake pop classes. 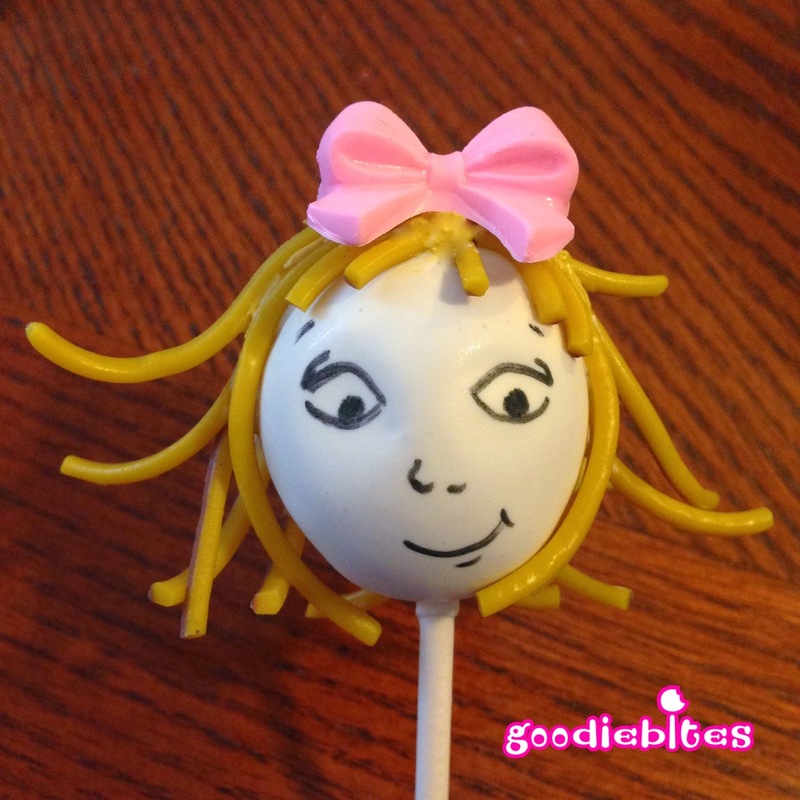 Also follow @goodiebites on Instagram and Twitter to check out my other cake pop creations. Thanks so much Lisa for another great cake pop tutorial and Congratulation on your upcoming Wedding! My daughter LOVES Eloise and we have already been watching Eloise’s Rather Unusual Halloween on Amazon . She’ll love these cake pops! Please follow Goodiebites on Facebook and check out online shop.